Paul Cross’ Paintmatic Nemesis. Right side. Paul Cross, of Paul’s Paintball Collection on facebook, recently discovered an amazing piece of UK paintball history, a complete Paintmatic’s Nemesis dating to about mid 1992. Paul Cross’ Paintmatic Nemesis, left side view. 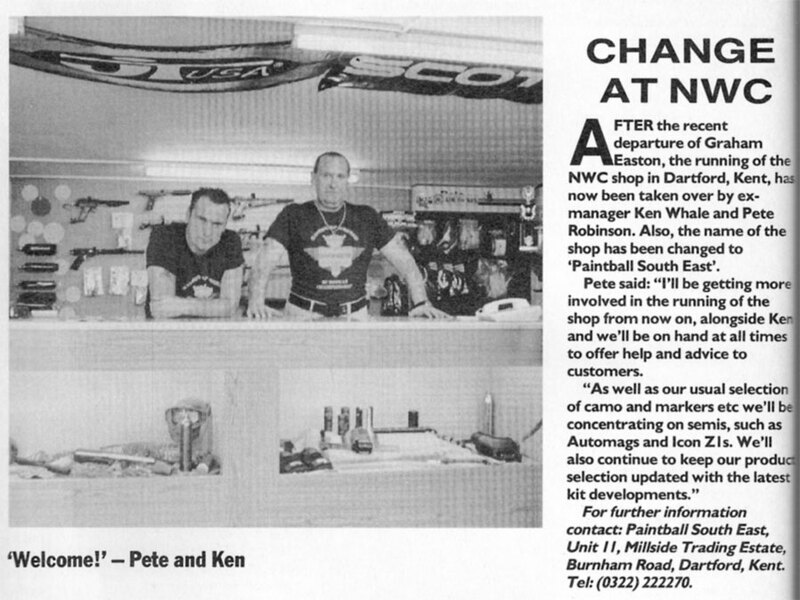 Paul is constantly finding neat artifacts of UK and European paintball history and discovering scans from UK based paintball magazines that are extremely relevant to the subjects I’m researching. This Nemesis find is amazing because it offers some insight into the standardized / finalized production model, the Nemesis’ existence at the NWC Shop and clue into the amount of Nemesis markers produced. Bolt, hammer, and powertube removed from valve and hammer sleeve taken off. 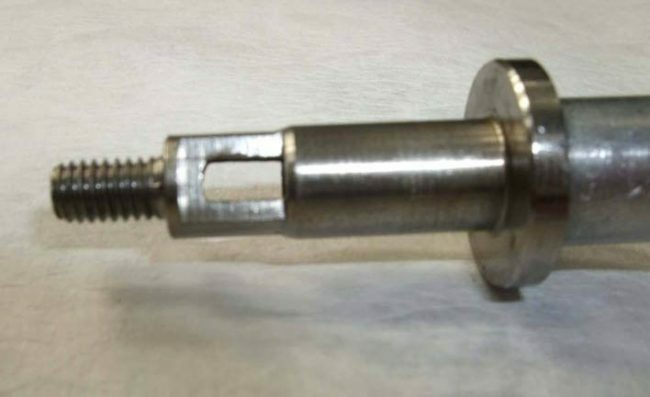 The Paintmatic Nemesis uses a valve system that is essentially a Nelson valve, a reverse hammer, and a blow forward bolt. The design was originally know as the Legend and featured the same wood accents and body style but the external body and internal components differed. The Legend was one of the first semi automatics produced entirely in the UK, but production never got off the ground. The individuals involved were rumored to be splitting their time between questionable operations and paintball marker manufacturing. Earlier Legend model broken down to show three piece body. The Legend model came with a three piece body when broken down to separate the breech, moving internal assembly (bolt and hammer) and valve body. 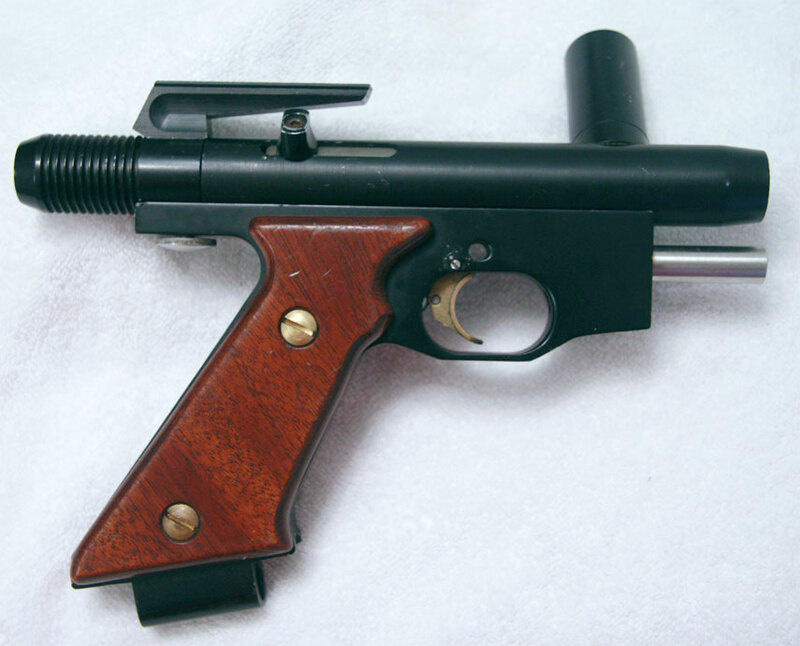 The Nemesis breaks down slightly different, with the valve and bolt assembly much closer in resemblance to the quick stripping of an Automag valve, although operation is significantly different. I’ve covered the Legends history in the following articles, The Legend by Paintmatic (part 1) and An update on the Nemesis and the Legend (part 2). 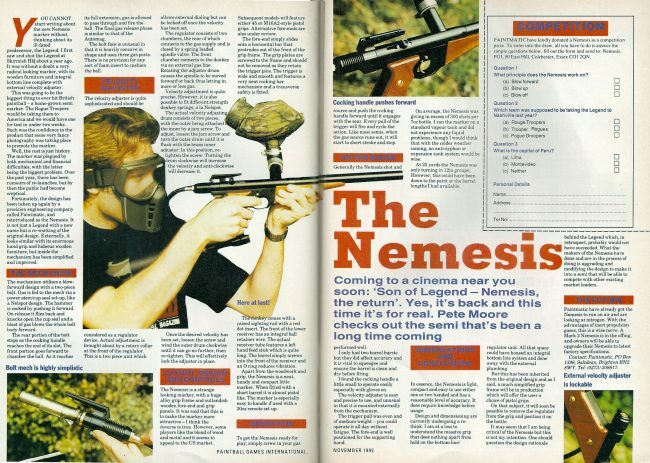 Paintball Games International’s November 1992 write up on the Nemesis. 1.3 meg scan. The Nemesis was featured in the November 1992 issue of Paintball Games International as shown above. Several years back I found an incomplete Nemesis with the help of Mike “Cannon Fodder” Carter. My Nemesis is missing the sear, the barrel, the foregrip, and the regulator parts. This November 1992 news blurb from PGI showed Ken Whale and Pete “Robbo” Robinson at the Paintball South East. Notice the Legend/Nemesis in the background. Valve sleeve on left. Crack in casing is visible. 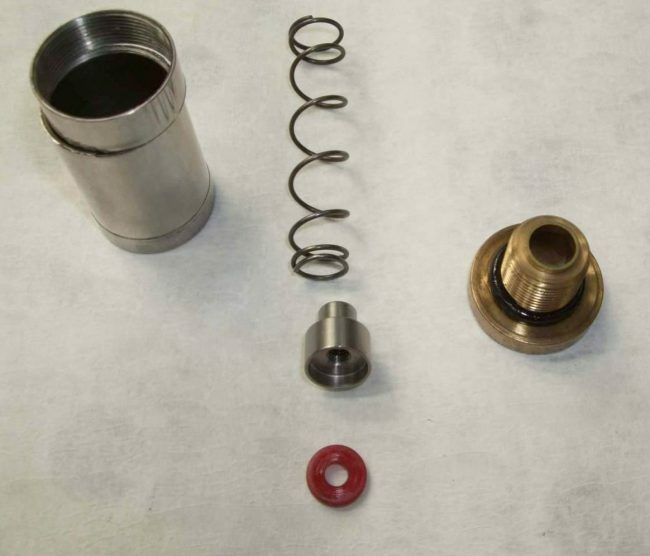 Valve spring, cup, seal and valve retaining screw also pictured. Photo courtesy Paul Cross. Valve assembly with bolt sleeve attached onto hammer. Photo courtesy Paul Cross. Crack shown in hammer sleeve. Photo courtesy Paul Cross. Bolt face. 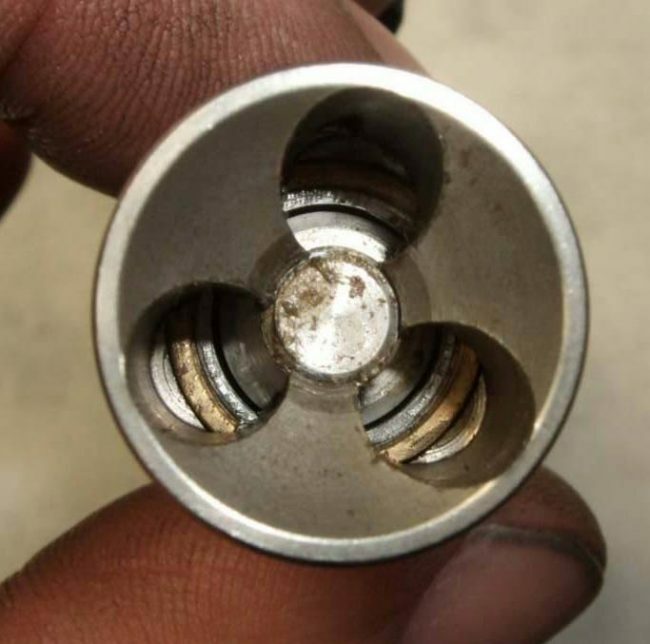 Center piece needs to come out to allow bolt to be removed from hammer assembly. Photo courtesy Paul Cross. 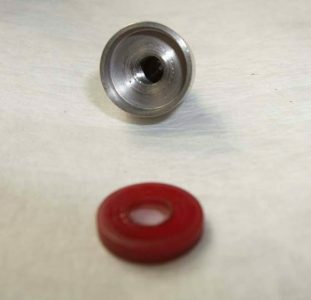 Valve assembly with bolt removed from hammer. Photo courtesy Paul Cross. Cup (top) and seal (bottom). Valve is based on nelson based pumps. Photo courtesy Paul Cross. 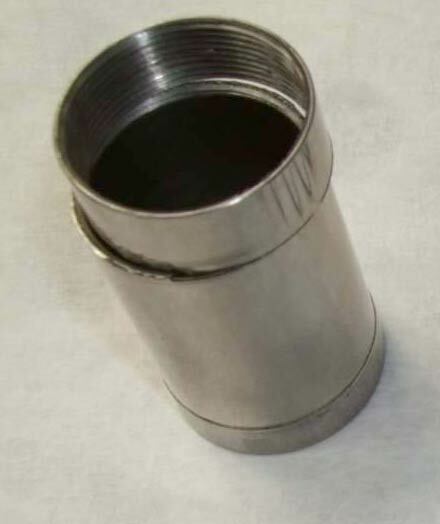 Paul sent several details of the powertube and cup seal used in the valve assembly of his Nemesis. Powertube tube end close up. Long notch at base could lead to cracking but also allows large amount of air to enter. Photo courtesy Paul Cross. The Nemesis’ powertube features a very thin base, which I would imagine, under regular use would lead to problems cracking and sheering off. Paul’s issue of his marker not recocking the complicated hammer assembly could possibly be resolved with a larger inner diameter powertube having more volume to blow the bolt forward, which, at the same time pushes the hammer back to recock the valve assembly (I believe that’s how the recocking on this marker works). Serial number on Paul Cross’ Paintmatic Nemesis. 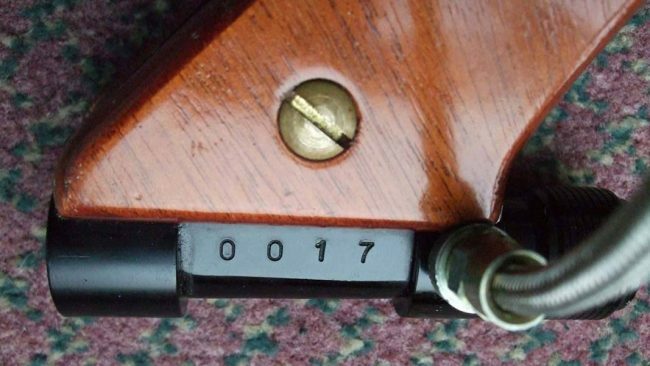 This Nemesis also features a serial number of 0017, which not only indicates it could be a production model, but offers insight into the actual numbers produced. 17 would be a much higher number than I would have guessed Paintmatic produced for the Nemesis model. As of writing this article and seeing Paul’s Nemesis I have seen 4 Legends in existance today and 2.5 Nemesis model (mine, which is incomplete being the .5) that I can track down. Sometime in the next few weeks I will disassembly my Nemesis to check for similarities and differences. My Nemesis lacks a number on the reg so it could either be unfinished or a pre production model. Giant thanks to Paul Cross for his photos, details and permission reposting! See more of Paul’s collection here.